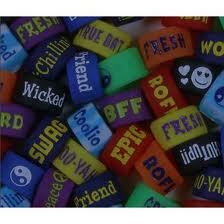 "The Handvibes are novelty rubber rings with interesting words on them in different colors. Featuring words and sayings such as “Rad,” “BFF,” “Epic,” “Dude,” “Boo-Yah,” “ROFL” and many more, HandVibes are a fun way for kids to display their attitudes on their fingertips. Adding to the collectability of HandVibes are ten rare black or blue swirl emoticon designs featuring smiley faces, winks, smirks and more, which are randomly inserted into just one out of every six ring packs. Since HandVibes are sold in packs with two visible rings plus a third ‘Mystery Ring’ contained in a hidden compartment, every purchase will have an element of surprise as kids discover if their Mystery Ring is one of the rare emoticon designs. With nine vibrant colors, 25 unique sayings and ten hard-to-find emoticon designs for a total of 235 unique rings in all, HandVibes are poised to become the newest craze in kids’ collectible, tradable fashion." What we thought: What a novel idea! The newest thing in tween fashion is HandVibes and even 5 year old A was excited about the samples we received:) The whole idea of the "mystery ring" is pretty cool, because who doesn't love a mystery?! The sayings on the rings are current and cool, perfect for today's tweens and teens. These rings are tradable, affordable and fashionable...what a great combination! ABCD Diaries gives HandVibes an A! Find out more about HandVibes here.